I’m looking at solar energy to power IoT device that will be used in a car. I did not found a lot of documentation on what we can do with solar panel and what kind of energy we can expect to get with a such system. This post will summarize the information I got on solar panels and measures done. I uses IXYS panel for my tests as they are the one I was able to find easily with Internet distributors and that look industrial ; I was looking for small one I could mount easily on a PCB. You can also find larger one from china but in my case they did not really fit my need. By-the way if I get some time I’ll test some. Polycrystralline – they have a spectral range of 500nm to 1100nm (visible to IR) and a performance of 13%. They are mainly use outdoor. The test I have made are based on a Monocrystalline cell with a 22% efficiency ; the main pain point I’m trying to evaluate is the impact of being behind a windshield in a car where the sun IR are filtered to avoid temperature growth. Meaning that the available spectral width will be limited. 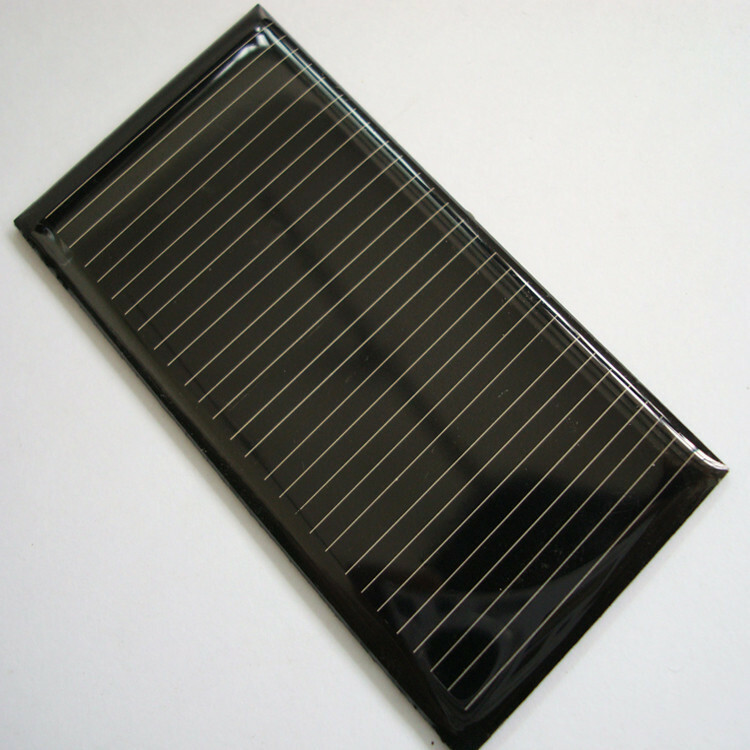 The solar panels are composed of one or more cells, the surface is generally the same for multiple devices, so depending on the cells organization you can choose between a higher voltage capacity or a larger current capacity. My first choice was a SLMD600H10-ND ($7 unit price) as my need is to power a battery for loading it, this module offers 5.01V/22.3mA in the best situation ; 2 or 3 of these module in parallel could be a good source of energy. Depending on sun exposure the voltage is varying ; also, depending on the load it will vary, based on U=RI formula. I’ll do some immediate measure by evaluating the current passing over a 10 ohm resistor and do some long term measure by evaluating current passing over a 2×10 ohm divider bridge and measuring voltage out of this divider with an ADC. The results will be collected, aggregated and transmitted over sigfox network. 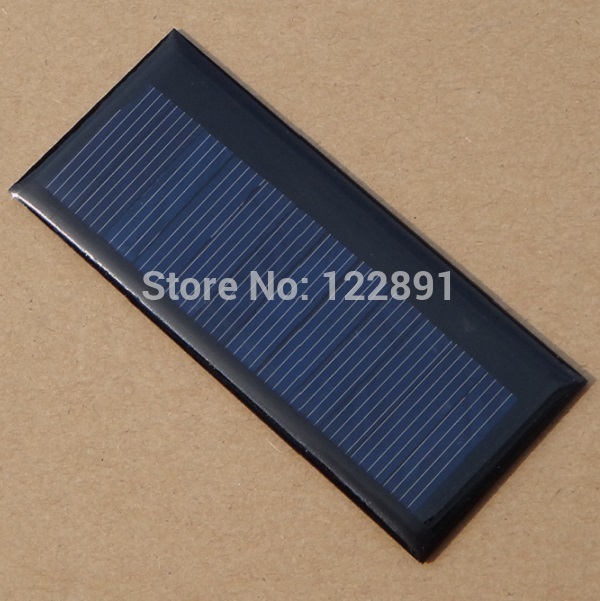 I made test with this POW11D2P a 5.5V – 80×100 mono-crystalline solar panel also $3.95 unit price. In these test, SOUTH / NORTH / EAST / WEST are in the sky direction, the windshield giving the angle. E/W-Horizontal means that I was using side windows of the car ; the sensor is in this case not pointing sky. What have to be noticed is that the cell is able to provide 22mA and that day in the best condition, it provided only 6mA. The previous day when I was calibrating the system, I’ve got some sunny period and got a production up to 20mA. The impact of the weather is really important to be taken into account. This panel is basically a 1$ solar panel based on mono-crystalline component. My morning test gave me a 49mA capacity (at 9am) outdoor. This panel is basically a 1$ solar panel based on a poly-crystalline component. My mornin test gave me a 40mA capacity (at 9am) outdoor. As my test purpose is to use them inside a car, as was interested in the impact on the technology in this case. As poly-crystalline have a larger use of IR it was supposed to be less efficient behind a wind-shield. This test finally goes at the opposite of what was expected… due to precision of my test it seems that we do not have a real difference between these technologies in term of ratio. The price is one thing but the quality is another. I received different lot of solar panel with different visible quality for China. I can confirm it is better to verify panels are working correctly as on a lot of 55 I have been tested 3 were not working (5%). The performance variation is up to 12% for a working panel to another. The average is 24,5 in the test conditions. The first way to power my circuit was to use an existing solution based on a LiPo charger circuit MCP73831T. This circuit is requiring 2,7 to 5.5 volt as input. The best way was to connect two solar panel in parallel to get more energy from them. 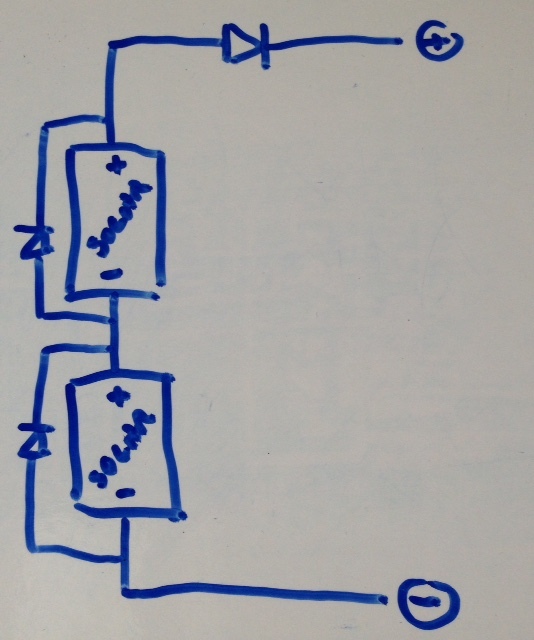 To get a higher current, it is possible to mount two (or more) solar panel in parallel; to protect them against current fall-back from circuit when solar panel goes to the dark, a diode is added in series ; to avoid current peak over a limit accepted by the circuit next to the panel, a Zener diode is added like in the above schema. When I did the measure I do not exactly know what was the battery state but charge current depends on battery charge level – by the way < 10mA is not a normal charing level for something like 50% charged. After looking ate the Serial Solution described above, I did a try with a Texas Instrument BQ25504 ultra low power boost for energy harvester application. This chip implements a MPPT system to optimize solar harvesting. This circuit have 3 diodes, the one on top is a blocking diode to protect energy loss in the panels when in the night. The two other are bypass diode : if one of the panel is in the shadow, the second one will be able to produce something the power level will be lower (only one panel). For a use with LT3652, we do not really need them as with 5V the circuit is not working. Be careful when connecting the battery to the sunny buddy, mine was reversed. Ground here is on the top as for the other load connector. I made a small change : removing the Timer pin capacitor : this is stopping battery charging after about 4 hours. So I replaced C6 by a 0 ohm resistor as indicated in the documentation to stop charging when C/10. This mean, the charging is finished when the overall load is < Isense / 10. By default Isense = 450mA so C/10 is too high. As my battery is 300mAh, default value is too high and as the maximum current I can get from the solar panel I’m using is 50mAh all of this is really too high. So, I also changed Rsense to have a 150mA Isense. This sounds really nice but in the real world it did not gave me the expected result: the LT3652 have a boost mechanism to extract the maximum power of the solar panel even with a small luminosity as a consequence it consumes battery energy for this. The matter it consumes about 10mA even if the load does not need this. And basically the battery is discharging more than it is charging if the solar exposition is not good. 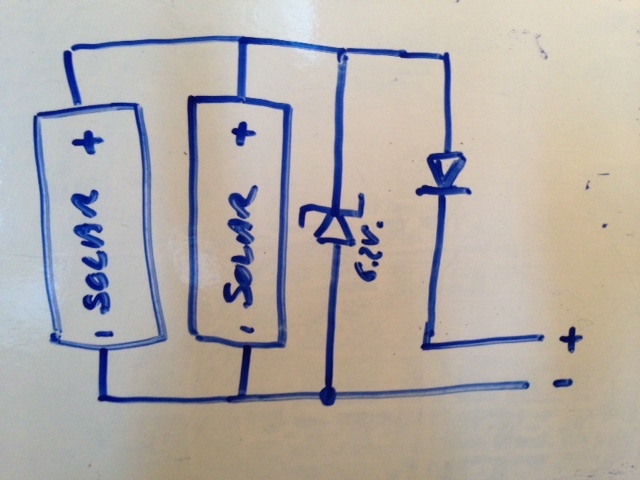 This solution was not the good one for my application with a small solar panel. I recommend to test it if you have large > 12V solar panel with a good and constant exposure. In this test, the sensor is put in a car and we don’t care about the sensor when driving and parking the car to get something like a real use case, even if not especially representative. 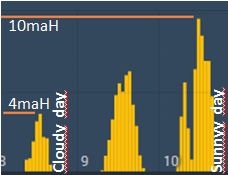 The first thing noticed is that energy is produce (> 1mA) from 8am to 5-7pm not more in a light-cloudy day. This is 9-11 hours of production only in good weather condition to refuel a battery. On a sunny day where I got about 40mAh per cell cumulated during the day. A dark rainy day has given about 12mAh cumulated the day. We have large variation depending on weather and for sure exposing time. This entry was posted in Hardware and tagged energy, IoT, solar. Bookmark the permalink. I have put a few electronic gadgets into my car, enough for me to start looking at putting a solar cell on the car for daytime recharging when at work and a magnetic port for recharging when at home (overnight) in the garage. Looking forward to following your adventures in this area. On sparkfun website you have the schematics. You will find C6.